To help students learn more about the many different roles biomedical engineers can play in the medical device and health care industries, the Department of Biomedical Engineering at Texas A&M University invited industry experts, which included former students, to speak at the department’s first Experts Panel event this fall. The panel provided a forum for students who are looking for jobs and careers in industry to hear from experts in the field. Each expert shared their own background in industry, with careers ranging from manufacturing to research and development to quality engineering. While each had a different story, panelist Tony Knight, director of quality at Medtronic Neurosurgery in Dallas, said initially graduates should expect to gain knowledge in many areas once they enter industry before they decide what they want to pursue in their career. “Choose after five or six years as you’re moving through your career where you want to focus and specialize,” Knight said. Students submitted questions for the panelists before the event and several were asked during the evening as well. One question was what students should pursue in college to best prepare them for the working world. Keith Nelson ’82, head of operational excellence at Novartis in Dallas, said leadership is key to standing out in an engineering environment. 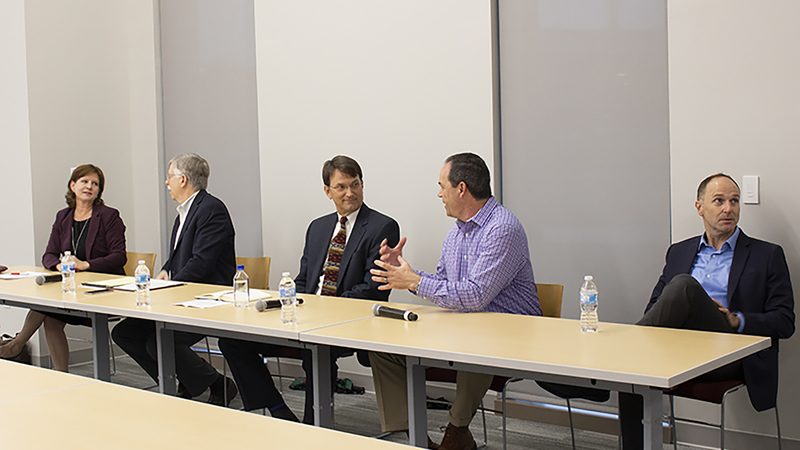 Another skill that helps applicants stand out is problem solving, said Jeff Summers, moderator of the panel and vice president of operations at Quest Medical, Inc. in Dallas. “You need to seize problem-solving opportunities while you’re here. 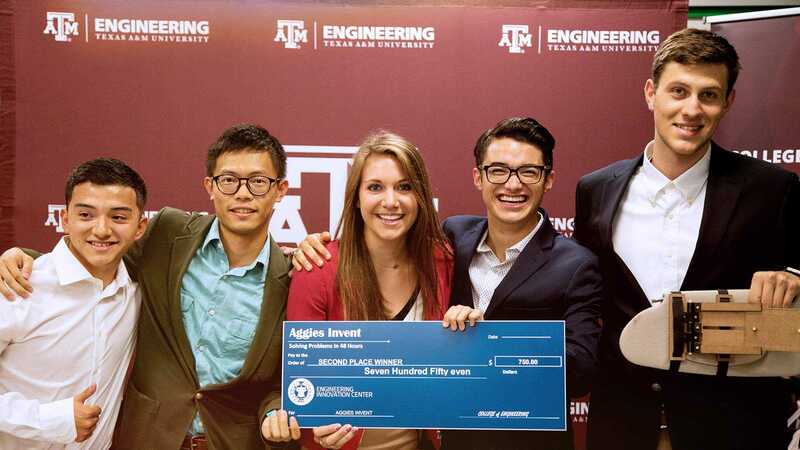 Whether that be in your classes or your group, you have senior design, the ENGR[x] program and others,” Summers said. Students asked whether the panel members thought getting a master’s degree right after their bachelor’s degree was preferred. There were mixed responses from the panel. Mike McGee ’78, and vice president for research administration at the Texas Heart Institute in Houston, planned to get his master of science after graduating, but changed course after he got a job at the Texas Heart Institute. Building from that comment, Steve Golden ’90, and chief operating officer at Coracoid Solutions, LLC in California, said starting to work in industry doesn’t mean further education is no longer an option. Two of the panelists have experience with startup companies, a topic about which biomedical engineering senior Linda Bustaman was excited to learn. Golden has started several companies and said finances can be a significant hurdle for a startup. On top of that, he said that overcoming the fear of failure is really the key. Jacqueline Havelka ’87, and co-founder and director of the technical writing company Inform Scientific, said it takes a lot of gumption to start a company. Hal Xu, second-year graduate student, said he appreciated how the panel included experts from different engineering areas. 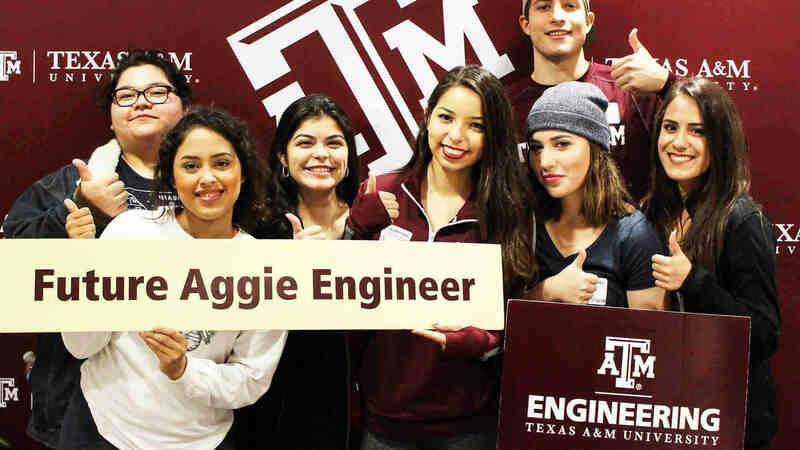 Olivia Cain, biomedical engineering senior and member of the Biomedical Engineering Society at Texas A&M, said she was curious to see what the panel was about, and appreciated the personal points of view from the different panelists. 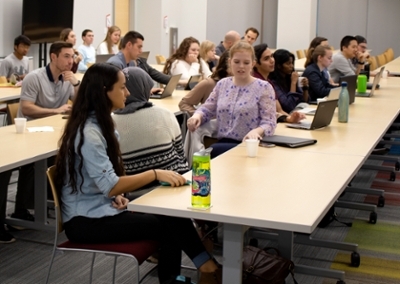 The Department of Biomedical Engineering plans to host similar experts panels in the future as a way to expose students to different career options as well as help them gain experience networking with former students in the medical device industry.